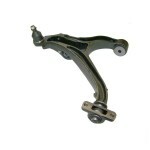 A control arm is a suspension link that is part of a cars’ suspension system connecting the chassis to the wheel hub. All cars have a control arm in the front and some times in the back. Some manufactures replace the control arm with a wishbone or use them in combination using the control arm as an upper link instead of a lower link of a suspension. On the front of a car the control arm is attached to pivots known as a rubber bushing allowing the wheel hub to move up and down. The Bushings absorb small vibrations from the road acting as a secondary suspension to the main springs reducing noise and vehicle harshness. At our Advanced North Attleborough Auto Repair shop, we inspect the entire suspension system to verify that the control arm or bushing are faulty before replacement. We also test drive the vehicle before and after to make sure that your suspension is working properly.